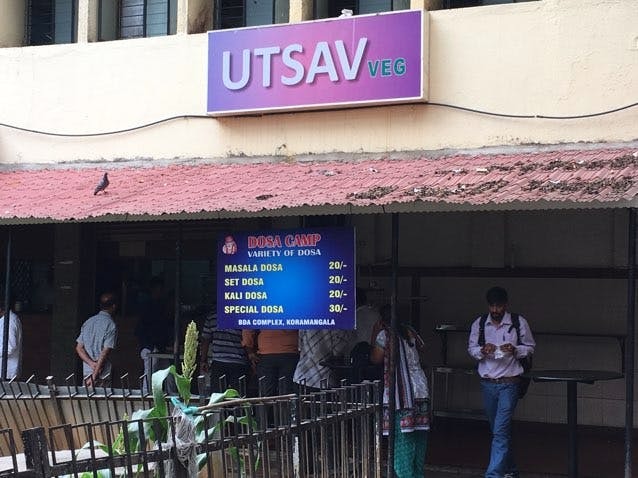 The next time you're feeling hungry, but you're completely broke, head over to Utsav's Dosa Camp in Koramangala's BDA Complex. With a full fledged dosa station that is manned by a cook armed with a spatula, they serve crispy dosas for those on the tightest of budgets. The most expensive dosa on this menu is INR 30. So fearlessly treat all your friends to as many dosas as they would like at this place and eat as much as your tummy can take. Their menu is pretty limited. They make only four kinds of dosa — masala, set dosa, special and kali dosa. So if variety is what you're looking for, you might be a bit disappointed. The Dosa Camp is an extension of the vegetarian restaurant Utsav. So if you want something to go along with that dosa, like a cup of chai or follow it up with some kesari bath, place an order with the main restaurant.